The Potawatomi, Ottawa, and other Native Americans were the first inhabitants of this area. The surrounding waterways were their trade routes. In the 1700s, settlers pushed westward from the eastern part of the country and Canada. Conflicts between Native Americans and the settlers culminated in the Blackhawk War in 1832. After the war, Native Americans were forced to move west of the Mississippi River, easing settlers’ concerns. This, along with the promise of the building of the Illinois and Michigan Canal and the fertile soil of the area, lured more people here from the east and from Europe. 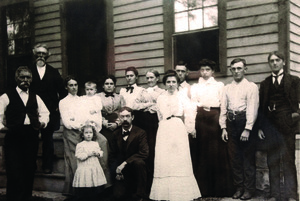 Thomas Andrus and his wife, Melissa, were the first to arrive in what would become Darien. They traveled from Vermont by boat through the Great Lakes to Chicago and came here in horse drawn wagons. 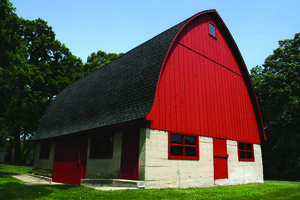 The Andrus farm was on the west side of present-day Lemont Road and the I55 North Frontage Road. Once an Indian Trail, the North Frontage Road was the route of a stagecoach line. The Andrus farm house served as an inn for stagecoach travelers. Thomas also kept horses for the stagecoach line. The families of brothers, William and Elisha Smart, and John Oldfield joined the Andrus family in establishing the community of Cass.. The Lace community grew north of the Cass community. It was centered at the intersection of present-day Cass Avenue and 75th Street. Among the first families of Lace, were the Andermanns and the Buschmanns who had emigrated from Germany. Joining these families in Lace were the Wehrmeisters and Warkentiens. Bordered by Plainfield Road, Cass Avenue, and 75th Street, “The Point,” was the center of community life in Lace. “The Point” included a general store and blacksmith shop, St. John Lutheran School, and the church parsonage. Directly east of "The Point" stood Conrad Buschmann's creamery where farmers brought their milk to be processed into dairy products. McDonalds stands on the site today. Just north of "The Point" was Lace Hall where dances were held. The entrance to Fred and Sophie Andermann’s farm is now the street leading to the Country Lane Apartments off Plainfield Road. Both Cass and Lace established churches that served as the anchor of not only religious life, but social life as well. The Cass community established the Cass Methodist Episcopal Church that no longer exits. The Lace community established the St. John Lutheran Church. The Cass cemetery and the St. John Lutheran Church cemetery each contain the graves of the first families and also include the graves of Civil War veterans. Both Cass and Lace established their own schools. The first Lace School was built in 1856. It burned and was replaced with the second Lace School built in 1925. Today, the 1925 building is known as Old Lace Schoolhouse and Museum and is the home of the Darien Historical Society. It stands at its original location, the northwest corner of the intersection of 75th Street and Cass Avenue. 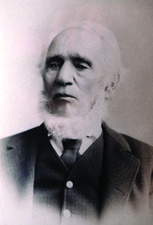 Martin Barnaby Madden's family emigrated to Lemont from England in 1869. A barge accident on the Illinois and Michigan Canal led to him being employed at the Western Stone Company. He rose tobecome its president. Madden married Josephine Smart, the daughter of Elisha Smart. In 1903, Madden built a summer home on Smart family property. His home, which he called Castle Eden, was built to be a replica of the White House in Washington, DC. It is now a part of the Carmelite Spiritual Center. Madden had an illustrious political career culminating in his election to the United States House of Representatives where he served from 1905 until his death in 1928. Cass and Lace were close knit farming communities. People living here grew up, married, raised their children, and lived out their days in familiar surroundings, embraced and supported by their extended families. The late 1940s, following the end of World War II, saw an increase in the affordability of automobiles and better roads. Better transportation led to people moving out of Chicago and the establishment of suburbs. Fields of wild asparagus were paved over and orchardswere felled as farmers sold their land to developers and subdivisions began to emerge where farmers had once raised crops and livestock. As the population increased, the need for increased services such as police and fire protection became apparent. Deciding that these concerns could best be addressed by becoming a city, four subdivisions, Marion Hills, Hinsbrook, Brookhaven, and Clarefield, formed the Combined Homeowners Committee for Incorporation. In order for the issue to be voted on by the residents, the proposed city had to have a name. A member of the committee, Sam Kelley, having recently enjoyed a visit to Darien, Connecticut, suggested the name Darien. 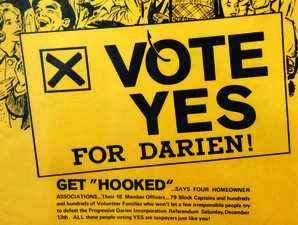 The vote on incorporation was held on December 13, 1969. It passed by less than 50 votes. Over the years, Darien has grown and changed, but it has continued to be a nice place to live. 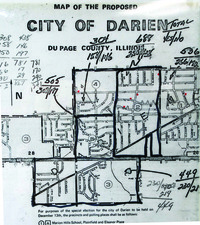 To learn more about Darien’s history, please visit Old Lace Schoolhouse and Museum visit facebook.com/dhsil, darienilhistory.org.